My first contact with this fantastic artist. The relation is now much deeper and I rather enjoy the full albums. 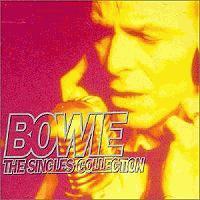 My mother in law now has borrowed the singles collection and I doubt that she will return it. An excellent anthology spanning several decades of one of popular music's most influential, revered and prolifically progressive artists. This album is an absolute requirement for even the most casual of Bowie fans, and anyone looking to start delving into his quite extensive catalog of releases would be wise to give this record a few spins first as many of Bowie's albums can be totally hit or miss. Roughly all of the classic tracks exist here, showcasing Mr. Bowie's masterful ability to continually reinvent himself stylistically, seamlessly blending and creating a multitude of genres in the ways that only Ziggy Stardust himself can do so perfectly. Perfect for new and casual Bowie fans and a great listening experience easily enjoyed played in its entirety.